Dan appeared on Good Morning America this morning to discuss the potential outcome for the Florida State University quarterback, Jameis Winston. Winston is accused of sexually assaulting another student over a year ago and prosecutors are expected to make their decision on whether they will press charges today. 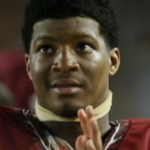 Winston is a candidate for the 2013 Heisman Trophy award and the timing of this investigation could potentially ruin it all. Says Dan, ” [Prosecutors] just got this case a few weeks ago, this has been a long time investigation but from their perspective, just the prosecutors, they’ve only been formally investigating this for a number of weeks. So they’re saying, “look, back off, to some degree all of you suggesting that this is somehow related to the Heisman or to the championship game ect. This is, in their view, a very typical investigation in a high profile case with difficult facts, where they need to take a little bit of time, but they’ve now come forward and I give them that credit…I don’t believe that the timing here is somehow connected to the championship game or the Heisman.” Watch the full clip here.